Our species has long been fond of pilgrimages. Here we see pilgrims who have come in their cars (they are, after all, 21st century pilgrims). They seek Enlightenment. They start at the foot of a high mountain and ascend exactly 1000 fully-resolved stairsteps to the temple at the top. They are wearing colorful casual clothing and sneakers. At the top they mill around in a big crowd, burn incense, say prayers, chatter, read their guidebooks, flirt, and take digital photos of each other. The antlike people seem lost in the vastness of the mountains. The mountain is so high that as they near the summit they are above the clouds. The artist is indebted to a friend named Liu (a native of central China) for the fact that China has several Taoist holy mountains of just this sort. One of them has 7000 hand-hewn granite steps to the top, worn smooth by the feet of countless pilgrims for many centuries. Tai Shan (泰山) in Shandong Province is one such holy mountain. Young and vigorous people love to climb mountains whether there is famous site at the top or not. Japanese find psychic rewards in climbing sacred Mt. Fuji. California yuppies in impressive numbers will be seen ascending the perfect snowy cone of Mt. Shasta on summer weekends. Visitors to Colorado climb Long's Peak or Mt. Bierstadt and boast of it afterward. Some purists might object that real mountains aren't this steep. 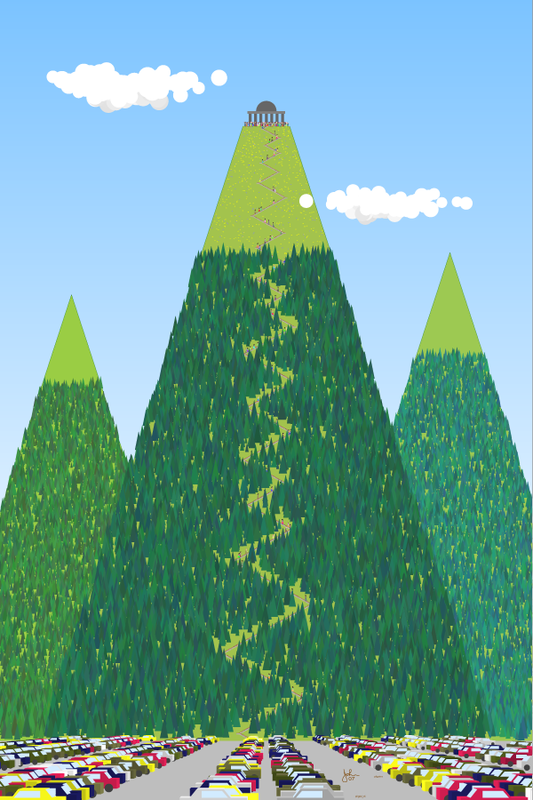 The artist insists that this mountain really is this steep, because the path to Enlightenment is strenuous and difficult. If it were not, would it truly be Enlightenment? A journey of 10,000 li begins with a single step. Because of the very fine detail in the images the source files have 400 pixels per inch at the finished size. This is equivalent to a 75 Mpixel camera image. Full printed detail is shown below.